In many anatomy labs, the brain has been removed so that it can be used by the Neuroscience course. 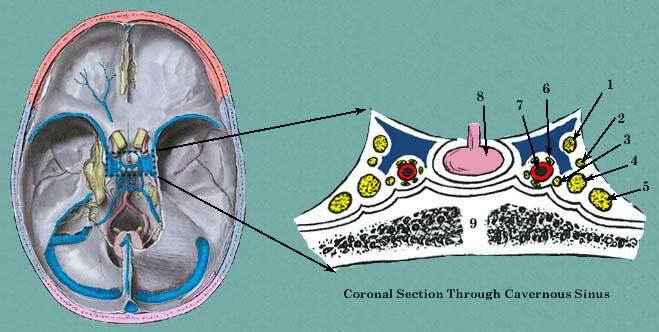 Whether this is true in your case or not, when the calvaria (cranial cap) is removed to expose the cranial cavity, the first structure you see is the fibrous side of the dura mater. This layer was fused to the endosteum covering the inner surfaces of the bones of the skull. 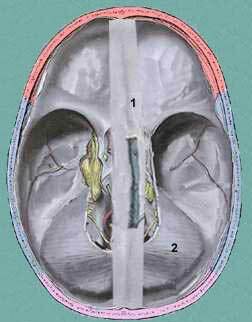 The dura mater has two layers: 1) fibrous outer layer and 2) smooth meningeal inner layer. 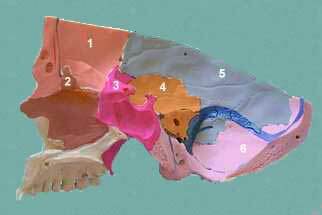 As with the spinal cord, there are three meningeal layers covering the brain: 1) dura, 2) arachnoid and 3) pia, from external to internal. The pia is inseparable from the surface of the brain itself. The arachnoid is normally in touch with the meningeal layer of dura and is connected by many connective trabeculae to the pia. 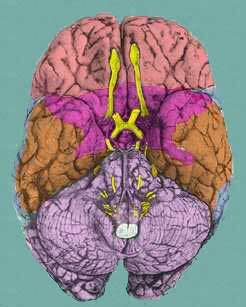 The space between the pia and arachnoid is the subarachnoid space within which the cerebrospinal fluid (CSF) is located. 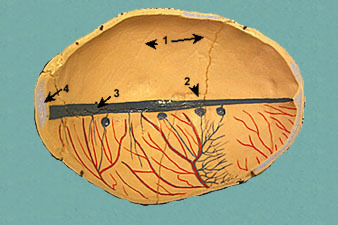 A space may be formed external to the dura, following trauma to the skull. This space is the extradural space. Another potential space can be formed by fluid or blood, and this is the subdural space. 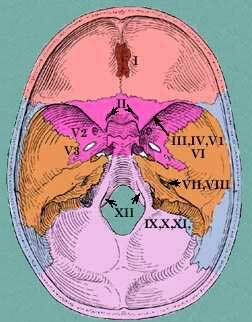 So, when examining the skull after trauma, there are three places fluid may collect: 1) extradural, 2) subdural and 3) subarachnoid. The prognosis of the traumatic patient depends on which of these layers is affected. Another bit of information about the dura. In certain areas, the meningeal layer of the dura splits away from the fibrous layer forming intracranial venous sinuses. When the meningeal layer pulls away, double layers of dura extend into the cranial cavity separating the left and right cerebral hemispheres from one another forming the falx cerebri. Another double layer of meningeal dura is formed between the occipital pole of the brain and the cerebellum and is called the tentorium cerebelli. 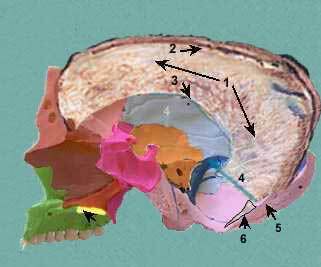 Now you are ready to identify these various structures within the cranial cavity. First, identify the various parts of the dura shown below. Look for and name the venous sinuses. 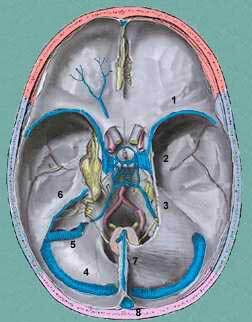 The superior sagittal sinus is located in the attached margin of the falx cerebri. 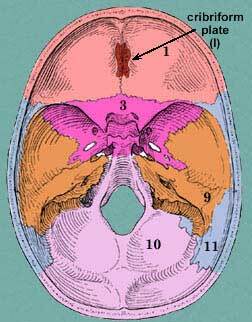 The inferior sagittal sinus is located in the free margin of the falx cerebri. 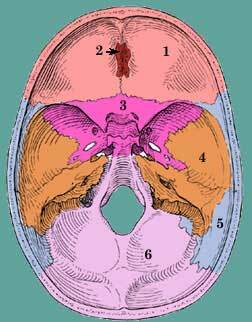 The transverse sinus is in the attached border of the tentorium cerebelli. The superior petrosal sinus is in the attached margin of the tentorium cerebelli where it attaches to the upper border of the petrous temporal bone. It might be useful at some point in your education to understand the relationship of the cranial cavity to the base of the brain. This is shown, color coded, in the following images. Compare the base of the brain with the skull adjacent to it and you can see which parts of the brain are associated with which bones of the skull. The images below demonstrate how the cranial nerves appear with the dura intact and then the foramina that the nerves pass through to leave the cranial cavity.